Well… to say that this was an experience is putting it lightly. Emily and I are trying to attend more events around Krakow. When we heard Cirque du Soleil was coming to Krakow we booked tickets right away. I had never seen a Cirque du Soleil show before but I had seen many clips of shows online. A colleague of mine told me that these shows were life changing and I can say that my life has been changed. What I witnessed was unreal. 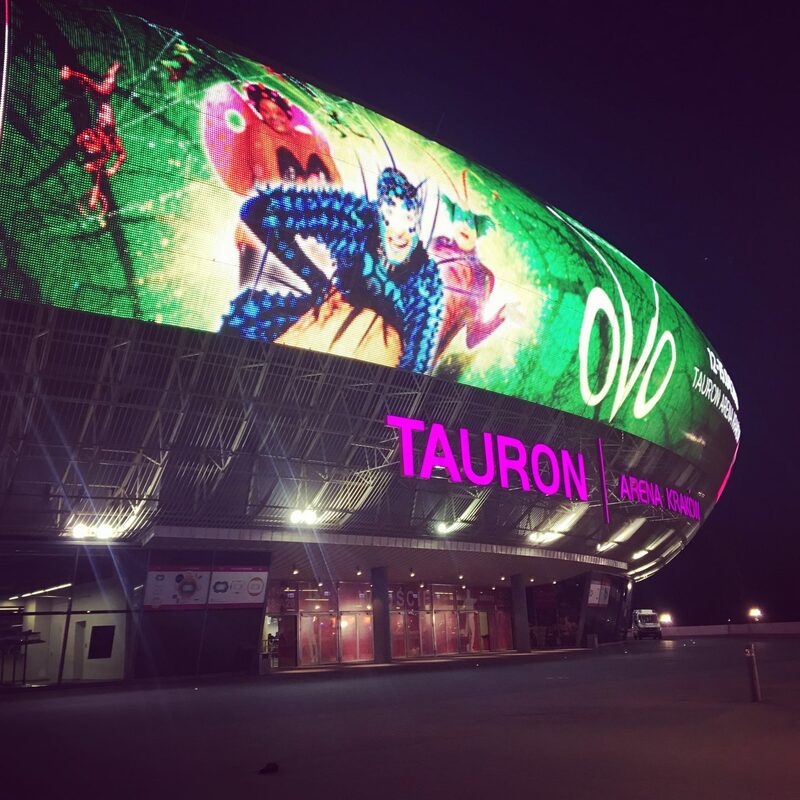 The show that came to Krakow was Ovo. It is about bugs and insects. I am not a fan of bugs and insects and this proved to be a huge problem while attempting to enjoy the show. As I watched, I honestly wasn’t too impressed. First of all if you can’t handle the clicky, squeaky noises that bugs make this show is not for you. I felt like I was on sensory overload as all sorts of clicks, chirps, shrieks and other bug sounds filled the arena. It was all a little too much for me but I tried to push through. It didn’t happen. I could not get over it. It is one of the reasons we left halfway through. When these bug creatures started scurrying about on the stage I knew that I would soon have nightmares featuring these people. I can confirm that it has happened. I’m not a big fan of people dressed in costumes like clowns and things and these costumes were just too much for me. All too too much. They looked like bugs and they moved like bugs (which I do understand is the whole point) but I am convinced that one of them is probably a serial killer using this weird costume to lure in victims. I immediately became uncomfortable when the bug people started wandering out into the audience before the show. Thank god I was sitting too high up for them to come near me. I would have screamed and left before the show even started. In hindsight that would not have been that bad. I really don’t think you are supposed to see Cirque du Soleil if you have anxiety. These sorts of events are really not for you. I found myself far too anxious as I watched them throw the ladies into the air from platform to platform. My palms were sweaty and my heart was racing just waiting for one of them to fall to their death. These horrible jumps, some of which were barely pulled off, combined with all of the clicks and the noises put me over the edge. At intermission we decided we had to leave. We were actually going to leave before intermission but it all just happened too suddenly. Now we had our fair share of arena issues when we went to see Bieber (this was held in the same location!) but escaping this show proved to be a very challenging act. All of the doors were guarded. We went to one door and the lady said the show was not over and we had to go down to a different door to leave. We went to that door and the lady directed us back to the same door we tried the first time. This started to give me even more anxiety. Would we even be able to leave Cirque du Soleil or would we be trapped in this arena forever? It reminded me of attempting to leave the homecoming dance early in high school when no one would let you leave even only 10 minutes early. Finally we attempted a new door and the man was starting to talk to us as two other people walked out and we just walked away from him and left. I cannot even tell you the relief I felt after leaving the arena. I was out. I was safe and I had survived. In case you are still wondering I do not recommend seeing Ovo… unless of course you don’t have the issues I have. In that case, I hear it can be life changing.